Sharif in occupied Jerusalem. The move was the latest in a series of provocative acts by the occupation regime, and the violent, fanatical colonists who represent a key support base for the current far-right government of Benjamin Netanyahu. The provocative act seems designed to elicit an angry reaction from Palestinians, in order to “justify” another brutal crackdown on protesters. And the closure of Bab Al Dhahabi did indeed spark clashes with Palestinians. Dozens of occupation soldiers defiled the sanctity of the complex by entering forcefully and assaulting a number of religious figures. Tension has mounted in the occupied city since February when the regime sealed off Al Haram Al Sharif’s Al Rahma (Mercy) Gate, located adjacent to the eastern wall of the Old City, sparking angry Palestinian demonstrations. In the weeks since, occupation authorities have banned many Palestinians — including religious officials — from entering Al Aqsa Mosque. In an act clearly intended to provoke, a viral video showed an occupation regime soldier deliberately entering the masjid with his shoes on. tensions as Netanyahu cosies up to extremist and far-right Jewish fundamentalist groups. As all this has been unfolding, the international community has been conspicuous by its deafening silence. It appears that the regime of Netanyahu — extreme even by Israeli standards — has been given a free hand by global and regional powers to do as it pleases with the Palestinians under its occupation. There doesn’t seem to be even a pretence of anger and revulsion at Israeli actions. Palestinians can be forgiven for believing that they are essentially on their own in their just struggle for independence from a powerful and brutal occupier. While the administration in Washington is the most pro-Israel in US history, the silence of the United Nations, particularly Secretary-General Antonio Guterres, is alarming. 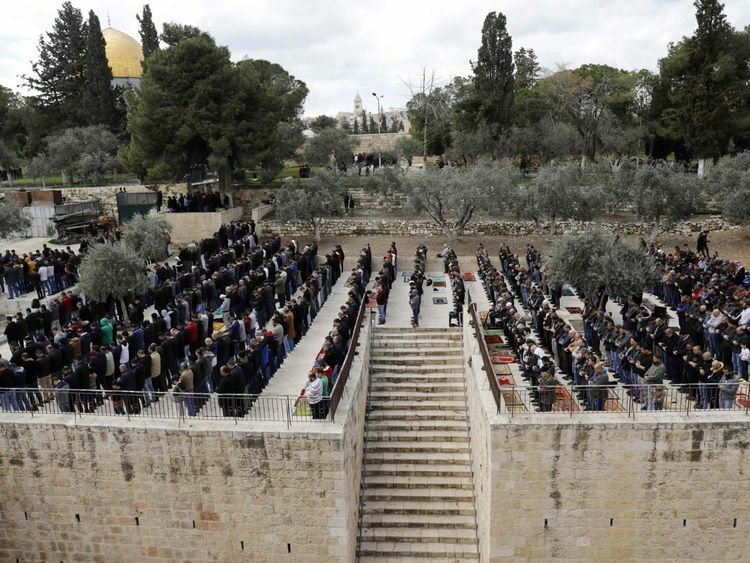 Jordanian lawmakers on Monday sought to expel the Israeli ambassador from the kingdom in response to ongoing aggression at holy sites. The kingdom is the official custodian of occupied Jerusalem’s holy Muslim sites. Lawmakers also called on the government to address the UN Security Council. But what has been shocking is the relative silence of the Arab League. While it has called Israeli actions “a dangerous escalation”, it has done precious little about them. At the least, the League can work the diplomatic circuit at the UN and get the issue the international attention it deserves, in order to pressurise the regime in Tel Aviv to change course. Or is that expecting too much?